I have an issue with MuTect2. I'm using GATK last version (nighlty build from 16th of March) in a somatic context on an amplicon design. I have a variant that I know is true one (although the depth of coverage at this position is quite low in the somatic context). It seems like it considers the 3 variants to be clustered and on the same haplotype, that may be important for my issue ? Although 222 from 263 is already quite far away.. When calling in paired mode, feeding it with the recalibrated germline bam file, I have no variants left, even though neither of these 3 variants is a germline one. Could you please tell my the reason why those variants are filtered out ? Is there a parameter I should play with ? Can you please post the original BAM and bamout BAM for both the tumor and normal in the region? Sure ! Here you go. first picture is the original bams. Top is tumor, bottom is normal. Second picture is the bamout. Top from the paired computation, second from the tumor only. As you can see, no reads left in the region when doing a paired analysis. Same parameters for the 2 commands except the input_file:normal. Same interval. I have a few suggestions. Can you try adding -forceActive and -disableOptimizations to your commands? I think the normal sample might be showing evidence for the SNP as well, so it is considered germline in the paired analysis. Sorry for the delay in my tests I was on another project for the past month. I tried your 2 parameters and yes, it does recover the variant in the paired mode. Attached is the bamout file from the paired computation using -forceActive and -disableOptimizations. Do you think I should be using the 2 as a routine when analyzing in paired mode ? Do you think this may be due to the amplicon design ? Okay. So, in the above post, the reads are from tumor, normal and artificial haplotypes. Can you please post the IGV screenshot with the reads colored by sample? I would like to see if the normal has evidence for the variant at the site. To be clear, those two arguments are just troubleshooting parameters and should not affect results. We certainly don't recommend using them systematically because they will significantly slow down execution. @Geraldine_VdAuwera Slowing down execution does not matter here as soon as it doesn't miss true positives (diagnostic context). I prefer having more false positives than missing true somatic variants. So this is just a matter of slowing down ? @Sheila the reads are already colored by sample but the coverage is high so I cannot show it all in the screen shot. Can I transfer the bam in private maybe ? Okay, so you are saying the tumor reads only show the variant, and none of the normal reads show the variant? In that case perhaps it is best if you submit a bug report. Instructions are here. @manon_sourdeix Using these arguments should not make any differences to what calls are made or not made. It just provides more information about what the variant caller sees. sorry again for the delay ! Hope this can be fixed ! Sorry for the delay. I am having a look now. Can you tell us how you know the variant at position 32900222 is true? 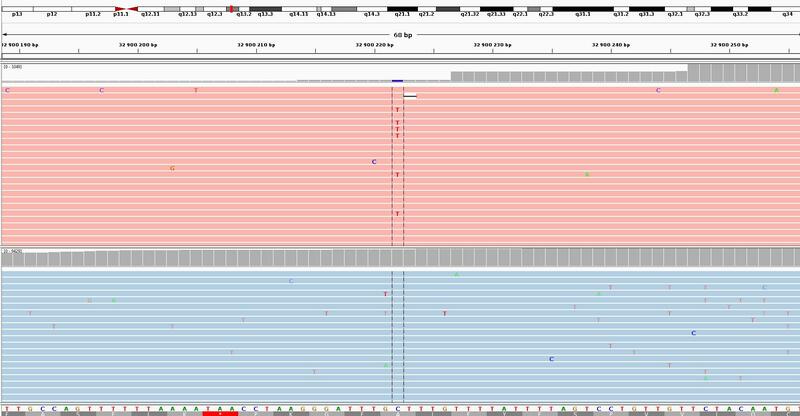 We analyzed this data with another tool that identified the variant and then we went back to the tumor sample, designed primers and checked it by Sanger : it was there. As for your issue, I put in a feature request for users to be able to change the thresholds for determining active regions. Ok thank you, for now I will use Mutect in a non-paired mode to be sure I do not miss anything.